With the rapid developments in aircraft design and passenger capacity, coupled with the rise in popularity of certain airlines competing hard for increased sales, I set myself a specific task – that of experiencing two popular long haul routes (Asia and the USA) with four different airlines…two Gulf based (Etihad and Qatar with one stop at their respective bases) then onward to South East Asia…one flying non-stop London to Bangkok (Thai Airways) and one to the popular destination of Orlando (Virgin Atlantic). To be as fair and constructive as possible, I decided to set certain parameters – a time scale not exceeding 8 months – all flights in Business Class and taken at the peak season of each destination, which would reflect the best comparisons as regards to price competition and quality of service. The following is an account of those experiences, ending on 5th March 2107. 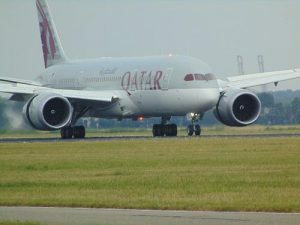 A round trip from London to Bangkok, via Doha. Check-in at Heathrow terminal 4 was seamless. Their new Premium Lounge was certainly a class act, spacious, comfortable and bulging with ‘goodies’. A very pleasant place to spend the time until departure. That very departure was spot on time and lift off a genuine surprise for such a whopping aircraft, the Airbus A380, as the quietness of its powerful engines thrusting us upwards was commented upon by the many passengers I spoke with en route. Of course each airline has the cabins of its aircraft configured to suit. On the upper deck, I found the positioning and design of the seats (fully lie flat) satisfied me (a 6 footer). They were comfortable, the controls easy to operate and the facilities cleverly fitted into the angled space more than adequate. The entertainment system was modern, as expected, and covered many genres of films, some only just released to cinemas, as well as TV programmes and interactive gaming. When the urge to stretch one’s legs is triggered, a few paces away is a really welcome place…a lounge complete with sofas, a well stocked bar – complete with barman of course – and the perfect ambient place to meet and chat (those quiet engines allow such) and if a glass of chilled, high quality champagne takes your fancy, then there it is. With an onboard chef on this first leg to Doha, the quality of food on offer was excellent and the menu varied enough to suit both European and Middle Eastern palettes. Landing at Hamad Airport was on time and the transfer via an hour or so in the Airline’s business class lounge went smoothly, as did the second leg to Bangkok. To find fault with the entire experience, one would have to be overtly critical and perhaps categorised as ‘nitpicking’, because it was apparent that the airline’s management strategy had filtered to the cabin crew and ground staff, who were only too happy to apply it. Wondering whether or not my return flights to UK would compare, I need not have done, because they were. I will offer my ‘league table’ placings at the end of this narrative. Two non-stop flights – London – Bangkok – London, commencing at Heathrow’s terminal 2. 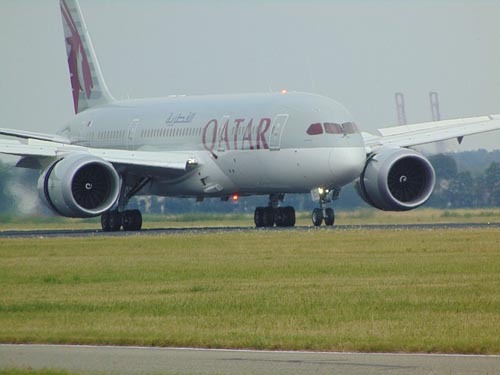 As the aircraft was again to be the Airbus A380, I was looking forward to it very much – it would allow me to make a direct comparison with Qatar Airways, although I was well aware that 12 hours or so in any aircraft was not something easy to bear. I would of course, need to take the differences in overall flight time as well as journey time into consideration. The first disappointment was a big one, a very big one. Having travelled by road from home to Heathrow, a journey of around 75 miles, to ensure arrival as required at check-in three hours prior to scheduled departure, I was greeted with the news that the flight would not leave on time, but some four hours (or perhaps more) after that scheduled time. That fact would mean that my overall journey time from home to Bangkok would be around 21 hours. The airline’s lounge is not dedicated to them but a shared facility in one of Star Alliance’s – just which one is dependant upon your destination but most likely their T2B if flying to Asia. The time of day is very much a factor as to the number of Business Class passengers using it prior to their various flights. Once aboard, passengers were promptly attended to by a smiling cabin crew, who must have been fully aware of just how fed up many would be after such a long delay but one must give credit for the way in which, throughout the flight, they performed their duties with skill and genuine warmth. Seating, quite naturally, was similar in layout to the A380 operated by Qatar Airways, the differences minimal but the comfort factor just as good. The on-board entertainment system I found to be less forgiving in operation and not as comprehensive. Nevertheless, it was acceptable. With 12 hours of non stop flight ahead, food was on offer at almost anytime of passenger’s choosing and lived up to the advertised quality and choice. Nothing seemed to be too much trouble for the cabin crew, who showed little or no sign of fatigue at anytime throughout the journey. Of course the late departure time meant that much of the flight was during the night. With window blinds lowered, lights dimmed and lie flat beds made ready and the engine noise barely an issue, sleep was possible until a gentle awakening for a breakfast of one’s choice. Being Thailand’s national carrier, the aircraft’s parking bays at Bangkok airport, benefit from their closeness to the immigration and baggage collection areas, which, when the vastness of the terminal means a very long walk indeed for those less fortunate. Disappointment number two (another big one) came when checking in at BKK for my return flight to London, “Sorry, sir, the flight has been delayed and will not depart until after midnight.” That meant yet another frustrating five hours until boarding time. The only factor which took the edge off my then dismayed attitude, was access to the airline’s Royal Orchid Lounge. Although crowded with so many delayed passengers (apparently my flight was not the only one to leave late), this lounge is tasteful and comfortable with enough staff on hand to consider passengers needs. Once on board, I experienced the same level of service as on the outward journey, but, of course, my new, much later scheduled arrival time would conflict with the arrangements I’d made for road transport to my home. It certainly did and was, in financial terms, an added stress factor. As per the conclusion of the Qatar Airways piece, I’ll reserve ‘league table’ positions for now. On this occasion, I was accompanied by my wife to celebrate our 65th wedding anniversary in the company of our son and his family who live in Florida, so the flights were from Gatwick to Orlando and return. Because of this special event, I’d bought tickets at the full published price for Premium and Upper Class cabins respectively. At check-in, although I had previously ‘booked’ the seats needed because of my wife’s disability, the staff at Gatwick had not been made aware. It took every ounce of my skill and patience to persuade them to re allocate the necessary seats. Stress level number one. – with more to come! Everyone who has experienced the situation once though the baggage check melee and into Gatwick’s departure area will know how seemingly chaotic it often is with so many flights coming and going, especially during the morning. Seats are often at a premium with cafes and restaurants full to the brim. Absolutely disgusted, I, for the sake of peace and the prevention of the Armed Response Team being called, held my tongue and escorted my wife away. Boarding the old Boeing 747 Jumbo (probably the same one I’d flown in twenty five years earlier) we were shown to the right seats. Now the flight. Took off more or less on time, so no problems there. The seats (in the Premium Cabin) were threadbare and hard and the recline limited to a few inches. There was no doubting the fact that there were insufficient cabin crew to cater fully and promptly with the number of passenger’s requirements and wishes. The cabin itself responded to the demand of the engines by rattling and squeaking, so normal conversation was at a premium – in line with the cabin’s designation of ‘Premium’. The food served was pretty grim. Rather than describe it in detail, please just accept the word ‘grim’. The tiny, nine inch entertainment screen was a throwback to the 80’s, picture quality abysmal and choice limited. Comfort…really awful, service…mediocre…on board facilities…close to a budget airline’s offerings. We were both glad to exit at Orlando. Perhaps our return flight in Upper Class would lift our spirits? Well, judge for yourself because this is what happened. Due to my wife’s inability to walk any reasonable distance, a wheel chair had been booked prior to departure date. Arriving at Orlando and the Upper Class check-in desk, there was only one…yes…one! That meant waiting in a queue, which, in my experience, was unheard of. Eventually it was our turn to show passports and travel documents. I was told at that point, that due to a shortage of staff, there was a very limited number of Special Assistance people to push wheel chairs so we would just have to wait until one became available. Good eh having spent in excess of £3000? Oh, by the way, if you are thinking that I should have then pushed the wheelchair, I need to say that I too suffer a disability and need a walking stick at all times. After a half hour had passed and no sign of a wheelchair, I sought out ‘Virgin’s’ duty manager to ascertain the situation. She was indeed apologetic and went off to rectify matters. Fifteen minutes later she returned with a young guy in tow and a wheelchair. Off we went, through the necessary departure procedures, onto the overhead train, off it and into ‘Virgin’s’ shared lounge facility, the Delta Lounge. To rank this in the same league as those provided by most major airlines is not possible. Think of the UK’s Premier League Football and Sky Bet League 2 and there’s the difference. While still discussing the earlier shambles at check-in, nibbling a ‘cookie’ and sipping a coffee and with 45 minutes to boarding time, the wheelchair reappeared, so, with refreshment abandoned we were sped to the boarding gate, given priority and took our seats in the Upper Class Cabin. The seat configuration (herringbone pattern) means that travelling companions cannot see or converse with each other without leaving their seats to do so. Nevertheless, knowing and accepting this when booking, we sat back and waited to get airborne. Champagne was offered pre take off by a smiling member of the cabin crew, which seemed to bode well for what was to come…that’s what I assumed, anyway. Being an overnight flight, the emphasis was to serve dinner and clear away as quickly as possible…at least that was my impression. As to the meal, adequate – but certainly not to the standard of other airlines Business Class, never mind Upper Class. Making the best of the very narrow, lie flat bed, we tried to sleep but found it difficult. Our fellow passengers of course, were silent, but such did not be deemed necessary by the cabin crew, who continued to converse, laugh and exchange personal experiences seemingly unaware that a simple closed curtain would not prevent noise transmission. The so called ‘Amenity Kit’ was pathetic as were the two lavatories, having to be shared with passengers in other cabin designations. Toiletries within were of poor quality and limited to the barest of essentials. Hey, ho, breakfast time. Up, bed reconfigured to a seat, face and hands washed and ready to order three of the items offered on the menu…a glass of orange juice…a bacon bun and a cup of coffee. They were served quite quickly….but…the orange juice was not pure, the coffee lukewarm and the bacon bun, cold, damp and soggy with the bacon filling uncooked. Totally inedible. Back at Gatwick, a wheelchair was waiting outside the aircraft door for my wife. ‘Great, I was thinking, at least they’ve got that right’. Not to be though. Instead the exercise aped a Fred Carno movie. Step one – wheeled up the ramp and deposited on a nearby bench. Porter then leaves to return to the aircraft for disabled person number two. Guess what? Yes, you’ve got it, he repeats the exercise until all disabled passengers are seated on the bench. By this time every able bodied passenger had disembarked and disappeared away to the arrivals hall. Porter reappears, informing us all that he will now go off and search for an electric buggy to transport us onwards. One could not write such a script…unless, of course, you happened to be the Ulverstonian, Stan Laurel. There we are then. 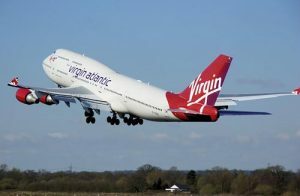 End of the Virgin Atlantic Premium and Upper Class experience. To complete my ‘Business Class’ exercise, I chose the well advertised Abu Dhabi based airline, which, operating a one stop Gulf service to Thailand, would allow me to compare it with Qatar Airways one stop service as well as Thai Airways non stop route. I need to admit that during my early preparations to fly with Etihad, I met with one specific problem – that of communication with the airline’s Public Relations and Customer Service departments both in the UK and at their Abu Dhabi headquarters. Just why there was a reluctance by them to have any kind of dialogue with me was most odd indeed. However, I did decide, based upon certain passenger reviews (negative and positive) to experience what the standards were as to the likes of ground facilities, passenger handling, quality of lounges as well as actual in flight services and aircraft comfort. Yet again, the first leg from Heathrow Terminal 4 to Abu Dhabi was to be aboard the A380, so I would then have three to compare. Check-in was a breeze, the staff efficient and eager to offer any assistance needed (probably when they noticed my walking stick). Soon through the ‘Fast Track’ system, I reached their Premium Lounge. This really is a cracker. Stylish, comfortable, spacious and welcoming. The food and beverages on offer are equally good. Plenty of well trained staff around to ensure that passenger’s every need was catered for. A first class, all round experience. The upper Business Class cabin sports a refined and pleasant ambience. The seats and surrounding area include cleverly sited facilities and plenty of storage spaces for handbags, shoes, reading materials and nicknacks. Lifting one lid of what looked like merely an armrest, was a compartment holding top quality, padded headsets and a delightfully designed, zipped amenity bag containing the very best collection of toiletries one would wish for. The cabin crew consisted of both sexes who, between them, spoke seven languages. Throughout the flight it was obvious that the number on duty was fully capable of attending to every need. I found all the girls to be delightfully polite and the men quite happy to join in with a joke as well as serve a whisky and soda as would a professional barman at the Ritz Hotel. I did have the opportunity to discuss the lack of cooperative communication I’d experienced…with the cabin supervisor more than willing to listen and report the issue through to the highest levels of Etihad management, which, I hope, will encourage it to listen, understand and correct? The on board lounge was styled according to the Etihad’s overall scheme and proved both popular and most enjoyable. All meals served were superb and the choice certainly sufficient. Food was available to order at anytime to suit any passenger’s requirements with not a hint of ‘resentment’ by the cabin crew. With the electrically operated, double opacity window blinds used, cabin lights dimmed and with such a quiet set of engines, sleep on the bed and covered with a padded quilt and with one’s head nestled on a comfortable pillow, came easily. Transfer through Abu Dhabi terminal and on to the next aircraft – a Boeing 777 – went as hoped. Although a very different aircraft and Business Class cabin configuration, the standards were equal to those experienced on the previous leg from London. I did not witness any complaints throughout the journey to Bangkok. 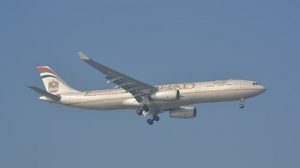 Unfortunately, whilst ensconced in a Bangkok hotel, my further attempts to communicate with Etihad by email in an effort to both relay information gained on the one hand, and get answers to a few questions I had, failed. Somewhat baffling and certainly a ‘first’ in my decades long travel experiences with most of the World’s major airlines. Perhaps, just perhaps, the relayed information by the cabin supervisor to her superiors may rectify what I do consider to be, a hole in the system which needs to be plugged. Both legs of my return flights to London equalled and mirrored those on the way out. 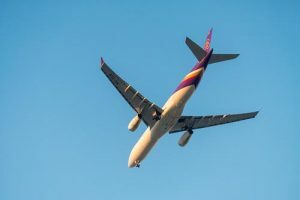 Although the flight from Bangkok to Abu Dhabi was delayed for almost an hour, the transfer of passengers and their baggage to the next awaiting aircraft was achieved without stress. The final flight in the A380 was, yet again, a pleasure to take. Without doubt (but with one exception) my opinion as to the standards and quality of services in the Business Class cabins of today’s airlines have improved – in some cases exponentially. Prices, naturally have increased out of proportion (some 4 times of those in the Economy Cabins) but that is to be expected, I suppose. Passengers opting to fly long haul journeys in Business Class will weigh up the costs versus benefits and decide accordingly. With the present trends of airlines putting extra prices on such as seat selection, companion seating, baggage allowances and, in some cases even food and drink, then the price gap does indeed narrow. Should this trend continue, then travelling in Business Class will become more attractive to those, who in the past, would never have considered it. My overall experiences in flying with the four airlines described in this narrative, has allowed me to come to a firm decision as to how each should, in my opinion, be listed in order of overall quality of service and standards…AND WHY! I do urge readers to please also bear in mind that only FOUR airlines feature in this critique, which has no bearing on what any other airline’s standard of service might be. In first place. By a narrow margin, I put Qatar Airways. Their aircraft are pristine. Their ground service could not be faulted. Their inflight service and standard of Cabin Crew leave little or nothing to be desired, and their prices are competitive. In second place. 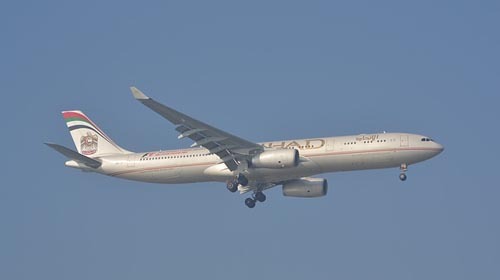 Etihad takes this because of it’s aircraft configuration, ambiance and profession on board crew. My only ‘grouse’ being the communications issue, which, if had not been as experienced, would have allowed me to award a DRAW with Qatar Airways. In third place. Thai Airways goes here. Not because its aircraft, on board standard of service and professionalism of it personnel, but due to it’s poor record of keeping to a scheduled, published flight timetable. Not only my poor experiences in this regard make me place it in third place, but noting the negative reviews of passengers suffering similarly. In fourth place. It may have been that if I had made more flights with other major airlines, some of them would have taken places higher than Virgin Atlantic Airways. My first flights across the Atlantic with ‘Virgin’ were way back in the 80’s, when Sir Richard was at the helm and stuck his finger into every aspect of his airline. He demanded – and received in exchange – the highest standards from all his employees. That fact was evident. Since that time, I have used ‘Virgin’s’ transatlantic service over 26 times and witnessed to my chagrin, it’s demise. Gone is the excitement. Gone is the enthusiasm of the ‘Red Coats’. Old Jumbo jets, well worn and most definitely outdated in today’s modern fleet of aircraft, should have been retired with warm congratulations years ago. What a pity to see a once proud company, bursting with energy and with staff displaying the highest morale, drift down the ladder of mediocracy, seemingly on the way to join the likes of some budget airlines with reputations at ground level.